Albuquerque Police Officers doubled as pet detectives after a home invasion turned into a tortoise heist this weekend. 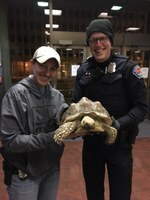 This story has a happy ending, though, the thieves were arrested and the valuable, stolen tortoise was quickly returned to her owner. Sunday, November 29th just before 6 p.m. three suspects broke into home on the 5900 block of Bellamah Ave. NE. One of the homeowners was still inside. He locked himself in a bathroom and called police as the thieves rummaged through the house. When officers arrived they quickly learned the crooks took something very precious, Cassy the owner’s pet tortoise. The victim worried kidnapped Cassy wouldn’t fare well in the winter weather and feared for her safety. Officers were able to get a vehicle description and learned who the suspects were. They spotted the suspects driving on the 11000 Block of Lipizzan SW a short time later. Inside the crooks’ car officers found grass from Cassy’s habitat, but no Cassy. 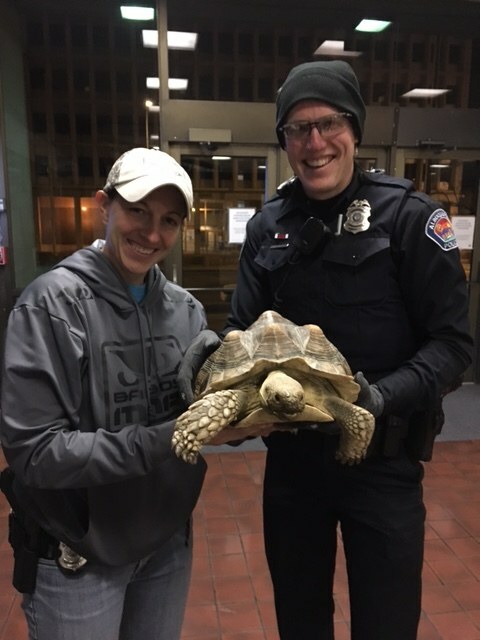 After skilled questioning the thieves confessed to Cassy’s whereabouts and officers recovered the tortoise without incident. She was inside a nearby home and unharmed. Cassy rode shotgun as officers took her home. Her owner was so happy to get her back, he was in tears. The suspects Michael Maes, 26, Armando Gonzales, 35, and Jorge Salcido, 33, face Aggravated Burglary, Cruelty to Animals and other charges.